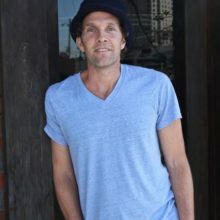 Jesse Itzler only eats fruit until noon, loves Run-D.M.C., and enjoys living life “out of the box,” actually, he doesn’t even have a box. He cofounded Marquis Jet, the world’s largest prepaid private jet card company in 2001, which he and his partner sold to Berkshire Hathaway/NetJets. He then partnered with Zico coconut water, which they sold to The Coca-Cola Company in 2013. He is a former rapper on MTV and he produced and sang both the NBA’s Emmy Award-winning “I Love This Game” music campaign and the popular New York Knicks anthem “Go NY Go.” Itzler is also the author of “Living With A SEAL” (New York Time’s Best-Selling book , #1 LA Times, #1 Amazon, #1 iTunes audiobook). When he is not out training for his next 100 mile run or being a dad to his four kids, Jesse can be found at the NBA’s Atlanta Hawks games, where he is an owner of the team. He is married to Spanx founder Sara Blakely and the couple and their 4 children live in Atlanta, Georgia.